For awhile now, I've had my eye on a little place in Mission that appeared to be a local favourite. One problem. I don't live in Mission, Maple Ridge, Abbotsford nor Langley. Being out in Burnaby does not make it easy to get out there. However, an email by a reader urging me to visit the place and the fact I'd be out in Abbotsford made it doable. So after another visit to Castle Fun Park (my son apparently loves mini-golf and wasting money on games which only yield an eraser as a prize), we took the leisurely drive on Hwy 11 over to Mission. At first, I was wondering where my GPS was leading me. There surely wasn't a restaur ant down this street right??? Well yes it was tucked away in a corner behind a motel. Despite the location, the inside is inviting and so are the friendly staff. 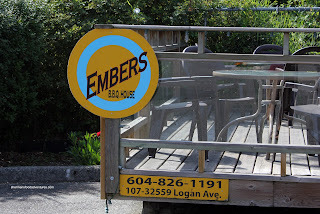 Unfortunately, their lunch menu does not offer their rib dinners; but we weren't that hungry anyways. 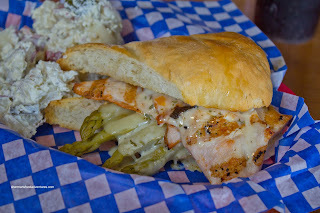 We ended up going for the Heidi Baked which is not, I repeat not the waitress smoking a fatty out back... Rather it was a fire-grilled chicken breast with mayo, tarragon sauce, pickled asparagus and melted Swiss cheese on house-baked bread. Viv and I thought this sandwich was a winner. 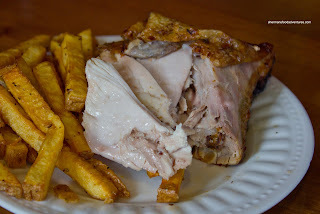 The chicken was perfectly tender with tasty grill marks. The tarragon sauce added both a richness and je ne sais quoi flavour quotient. Loved the asparagus texturally and the slight tartness. The bread did taste fresh and was crusty. The side of Potato Salad has to be one of the better ones I've had of late. With each cube of perfectly cooked red potatoes, just the right amount of dill creaminess married to the crunch of pickles, this was a tasty salad. The addition of the pickling juices afforded a nice balance to the mayo. We also shared the Pulled Pork Sandwich which was also served on same awesome stone-baked bread. Unfortunately, this was not what we had envisioned. We found the pulled pork to be chewy and stringy. The BBQ sauce was definitely leaning towards the sweeter side with a touch of smoke. The coleslaw had a nice crunch and tang; but it was too wet and made the bottom part of the bread soggy. 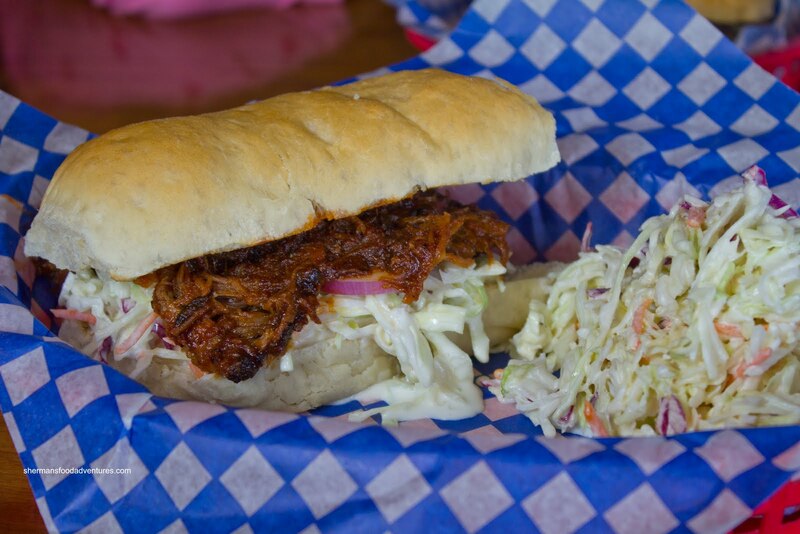 Not a great pulled pork sandwich, we liked the Heidi much more. Strangely, the side of Coleslaw was not as wet and was very good. Nice crunch, tang and just enough mayo. For the kiddies, we got the BBQ Chicken meal which included a choice of one side and drink (a steal at $4.49!). I sampled it and it was very flavourful throughout. It was sufficiently tender with a nice BBQ taste to it. The Fries were fresh cut and quite crispy. Loved the pepper on them. Despite the disappointing pulled pork sandwich, Embers was inexpensive enough for us to leave satisfied. 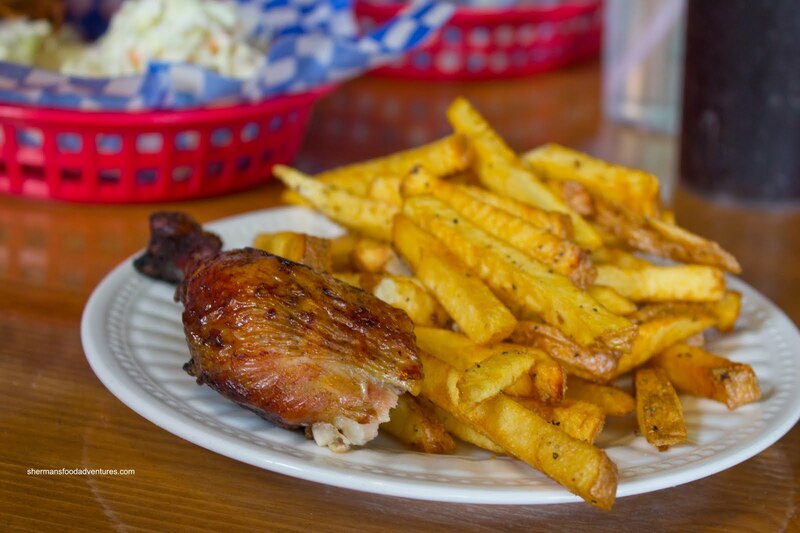 Sure, the food won't blow anyone away and probably would be hard-pressed to compete with the big boys in Vancouver, but it offers up something that is not readily available out in this neck of the woods.